Home » »Unlabelled » Muslim Families Out to Eat on Christmas Eve Finished Their Meals and Asked for the Check. What They Saw on the Bill Returned to Their Table Is Going Viral. 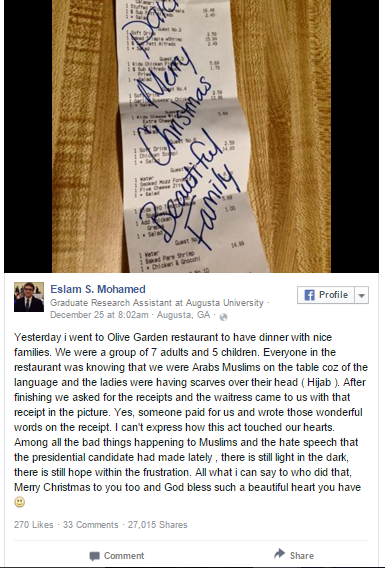 Muslim Families Out to Eat on Christmas Eve Finished Their Meals and Asked for the Check. What They Saw on the Bill Returned to Their Table Is Going Viral. What happens when a group of Muslim families enter an Olive Garden for Christmas Eve dinner in Augusta, Georgia? With everything we hear in the media nowadays, you probably won’t expect what happened in this case. Eslam Mohamed took a photo of the bill and then posted it on Facebook. It’s been shared 19,000 times. He noted that the seven adults and five children were recognized as Muslim due to hijabs that were worn by the women, as well as the language they were speaking in the restaurant. Share this wonderful gesture with friends and family.